I discovered Crushcakes soon after moving to the Santa Barbara area, and every time I go back I love it more and more. The people who work there are friendly and helpful, there are indoor and outdoor seating areas, they use compostable to-go boxes, and there is a little sign above the stack of napkins in the coffee area that says, "We come from trees!" I think it's cute to imagine the napkins shouting that in their little napkin voices. Crushcakes also has a vast selection of hot sauce options (and I am not one of those people who overuse the word "vast"). That doesn't matter much to me because I have zero tolerance for spicy things, but it's the cafe's best selling point for some people. 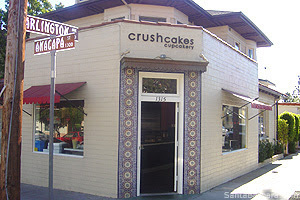 Imagine my delight when my Yelp search for "vegan brunch" in Santa Barbara brought up Crushcakes as one of the first listings! There aren't very many vegan breakfast options, other than oatmeal with fruit, but they're pretty flexible about making any lunch option vegan. Some of their menu items are even labeled with the word "vegan" in parentheses. I was quite pleased with the little heart shape drawn on top of my tomato soup - until I realized that it was probably made out of cheese. Luckily, it was just kind of resting on top of the soup and hadn't permeated through it. Andrew had brought a few different hot sauce bottles over to our table and was, apparently, alternating hot sauces for each bite of his breakfast burrito. I interrupted his ritual to ask him to eat the cheese-heart off the top of my soup, and of course he obliged. After that, the soup and panino were both tasty. These were vegan cupcakes! With little chocolate hearts on top! I bought one (of course) for $3 and ate it up quickly. It tasted just like a regular cupcake except a bit moister. And "moist" is one of those words that is only acceptable when used to describe a cupcake.